Bills free agent visitor Matt Slauson was at One Bills Drive to meet with the coaching staff. He was drafted by the Jets when Bills head coach Rex Ryan was running the team down in New York. He also was coached by Bills offensive line coach Aaron Kromer in Chicago in 2013 and 2014. Ryan remembers how the Jets came to draft Slauson back in 2010. Slauson stopped out to watch a little of rookie minicamp. Buffalo will go into Sunday’s game with just three offensive tackles. Cordy Glenn and Cyrus Kouandjio will start and then newly signed OT Jordan Mills will be serving as the swing tackle. Needless to say a trans-Atlantic trip and cramming a playbook into his brain has been a heavy lift this week. Mills was in Detroit when he got the call that Buffalo was going to sign him and didn’t have much time to pack for the trip. Mills is thankful that Buffalo’s offensive line coach is Aaron Kromer, who coached him for two seasons in Chicago. “The first two years Kromer was my O-line coach and teaching me techniques. So coming here was nothing new in terms of the techniques that he wanted,” he said. “I already basically had everything in my mind. I just had to refresh and knock the rust off because it has been almost a year or so. As far as Greg Roman’s playbook goes he is using translation techniques from the previous system he was in to remember what the terminology in Buffalo’s system means. As he gets more and more acclimated to Buffalo’s language things will get better. In this short week however, knowing he’s a play away from being on the field, Mills is just focused on studying this week’s game plan inside and out. Bills head coach Rex Ryan said there are no new developments with the situation surrounding OL coach Aaron Kromer, but with the veteran coach on paid administrative leave, assistant offensive line coach Kurt Anderson is working in his absence. Buffalo also announced the hiring on Pat Meyer as team operations consultant, but he has an offensive line coaching background and will be assisting Anderson. When asked about where things stand with Kromer, Ryan said they were status quo. It took five rounds, but former Clemson OT Isaiah Battle was chosen by the St. Louis Rams. That according to ESPN.com. The Rams now forfeit their fifth-round pick in the 2016 NFL draft for drafting Battle. St. Louis made a concerted effort to improve their offensive line this past spring using four of their draft choices on offensive linemen including three offensive tackles. Now Battle will be the fifth rookie lineman added via a draft pick. Buffalo did their homework on Battle and even sent offensive line coach Aaron Kromer to Battle’s pro day to take a look. Battle has some off the field issues that were of concern to some NFL clubs. With Buffalo signing veteran OT Wayne Hunter just last week to be the fifth offensive tackle on their roster, it was unlikely that the Bills would give up a draft choice for the supplemental prospect. The mandatory minicamp is in the books. Six weeks until training camp at St. John Fisher. Let’s get to your latest round of questions on email at AskChris@bills.nfl.net and on Twitter at @ChrisBrownBills. Is there anybody that is already on the squad that might have torn up the practice fields that we haven’t heard about yet because they didn’t get much playing time? In other words, is there anybody on the team already that you think is either in line to break out or will push a current starter for a job more than expected? CB: There were a few players who performed admirably in the spring practices that didn’t get much time on the field last year, but I caution that football in the spring is not real football, so take these names with a grain of salt. Marquise Goodwin had a strong spring. He was turning in plays left and right in the passing game. Now keep in mind that’s without Stephon Gilmore, Leodis McKelvin or Aaron Williams running around in Buffalo’s secondary. And the pads aren’t on, which is when the game gets more physical and cornerbacks are jamming receivers a lot harder at the line of scrimmage. We’ll see what he can do at camp. Cyrus Kouandjio, as we’ve covered on Buffalobills.com, has improved his footwork and balance a great deal. We’ll see how he does in camp, again, when the pads are on. Two other players that I thought fared well, who could take a step forward this season are S Jonathan Meeks and TE Marqueis Gray. Both made plays in the spring practices and offer high caliber athleticism at their respective positions. Is Harvin slated for both return spots or just punts? CB: From what I witnessed at OTAs and minicamp Harvin is only being used on kick returns. The primary punt return candidates included Leodis McKelvin and Marcus Thigpen. currently have 5 running backs. Are Boobie/Bryce on the cut list to watch? I am not a fan of drafting a developmental running back with a history of violence against women, I don’t see the value in picking a back. Boobie plays special teams as well. Do you see O’Leary as lock to make this team too? Wondering how you might this these position groups look after the draft? CB: Adding O’Leary and Karlos Williams just deepens the pool of talent at their positions. I like what I’ve seen from both players in the spring practices. O’Leary catches just about everything thrown to him. I agree that there will probably be four tight ends on the 53-man roster. The tough call will be at running back where Williams has made a good case for himself. You’re also forgetting the fact that they’ll keep one fullback too who factors into the RB equation. So it’s likely they keep 4 RBs and 1 FB and 4 TEs. That could also mean the team only keeps five wide receivers. You’ve got to trim numbers somewhere else if Greg Roman’s offense needs numbers at TE. Could you share your thoughts and insights on our offensive line expectations? Our two glaring weaknesses from last season was the inability to protect or provide the QB position ample time to develop consistency in a passing game and the lack of developing a foundation with a running game. Many feel the offensive line play led to the lack of a better QB play although the argument could easily be spun both ways. Yet going into this next season our offense is mostly a mystery of what to expect. Despite the influx of talent brought in during F/A one could argue that we will be no better off than a year ago with the only hope that the new offense and scheme applied will either swing the pendulum one way or the other. Many feel that controlling the trenches is where it all starts regardless of how skilled your skilled positions are. Still another unsettling feeling deep in the souls of us Bills fans. Thanks for you time and efforts. CB: I’ll start by saying perhaps the two most important additions for the offensive line were coach Aaron Kromer and OC Greg Roman. Both know how to organize and coach line play. That’s where the two biggest improvements were made. Richie Incognito is a perfect fit for a power run game and John Miller has been widely lauded as Buffalo’s best pick in the 2015 draft and is expected to start at right guard. With Cyrus Kouandjio showing an improved skill set and Cordy Glenn in the best shape of his life I believe the unit can take a sizable step forward this year and perhaps rebound from their 25th ranked rushing attack last season and get back into the top 10. Whom do you think will take Dareus’ place in game #1? Do you expect 90 players will be there the first day of training camp or will that number be reduced because of OTAs? Jeff Tuel was just released, but Matt Simms took his place. CB: Right now the guy the Bills have penciled in to take Dareus’ spot in Week 1 is Corbin Bryant. Rex Ryan confirmed that when asked. Now will it be Bryant exclusively in that spot for the entire game? Probably not. Stefan Charles might rotate in there as well. I do expect 90 players at training camp. Coaches like to have as many bodies as they can at camp. Knowing the Bills intend to run two team units simultaneously at camp when they go 11-on-11 in practice, having 90 players will be all the more necessary. Bills offensive line coach Aaron Kromer has done his fair share of experimentation moving his linemen around during spring OTA practices. It’s still not the kind of football where Kromer can make effective evaluations of his players because the pads are not on yet. What he is doing is cross training many of his linemen to play more than one position. With his offensive tackles he’s exposing them to play on both ends of the line. One of those players is OT Seantrel Henderson, who has seen time both on the left side with the second unit and the right side with the first unit, the position he manned as a rookie in 2014. Bills new offensive line coach Aaron Kromer said he was going to be experimenting big time with his offensive linemen this time of year and into the OTAs and mandatory minicamp. He’s been true to his word as even in the walk through sessions on the field, and Seantrel Henderson has been working both edges each day. Henderson said Kromer has lined him up at both tackle spots quite frequently. Henderson was almost exclusively a right tackle in college at Miami, which is where he wound up for the Bills as a rookie last season. But not before he lined up at left tackle in place of Cordy Glenn, who was not medically cleared to practice in training camp and part of the preseason last summer. Henderson believes he can play left tackle. Like just about every other offensive lineman on the roster, Henderson has taken quickly to coach Kromer. He along with several other linemen on the roster like Kromer as a teacher. He’s a defensive coach by trade and a head coach by opportunity, but heading into his team’s first voluntary veteran minicamp in less than two weeks, Bills head coach Rex Ryan is looking forward to working with the offensive line the most. One can understand why Ryan might be paying a bit closer attention to what offensive line coach Aaron Kromer and offensive coordinator Greg Roman decide to assemble up front on offense for the Bills. It’s a picture that is far being in focus. Knowing that his defense returns 10 of 11 starters from last season and has a special teams unit with most of its playmakers back from last year’s number two ranked unit, it makes sense that Ryan intends to spend some time around the offensive line as it takes shape. “These three days that we have coming up…this voluntary minicamp before the draft…the thing that I’m most excited about is being with the offensive line,” Ryan said. “Being with Aaron Kromer; their position coach, Greg Roman; their system and things like but we have to get to know these players and all that. Next to determining the starting quarterback, deciding on the starting five up front is probably the second biggest question mark heading into training camp this summer. Bills OL Cyrus Kouandjio has admitted his mindset wasn’t strong enough for the pro game as a rookie. He feels he’s fixed that now. That combined with a new offensive line coach in Aaron Kromer has given the former second-round pick a new outlook on his NFL career. Kouandjio in his initial conversations with coach Kromer is optimistic about where things are headed for him personally with the Bills. Kromer said all five starting roles on the offensive line are open for competition as everyone will have a clean slate with him. 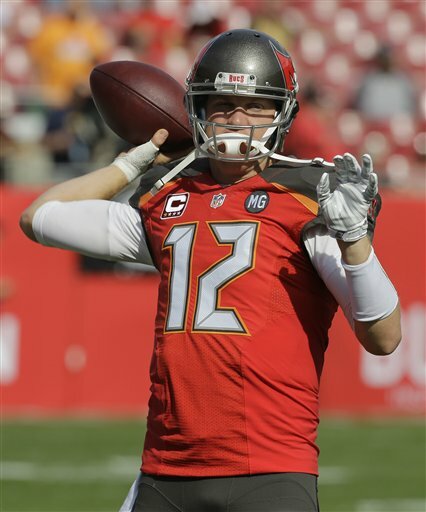 One year after signing veteran free agent QB Josh McCown the Tampa Bay Buccaneers have cut ties with the signal caller making him a free agent. A new member of Buffalo’s coaching staff has some familiarity with McCown. McCown spent three seasons in Chicago prior to signing a two-year free agent deal with Tampa last offseason, including one under former head coach Marc Trestman and former offensive coordinator Aaron Kromer. McCown had the best season of his career under Kromer and Trestman in 2013 when he appeared in eight games in place of an injured Jay Cutler. He completed more than 66 percent of his passes with 13 touchdowns against just one interception and a passer rating of 109. Things did not go as well in Tampa this past season as an early thumb injury sidelined him in Week 4 and he missed six games. His numbers weren’t as good either behind a suspect offensive line that allowed the third-most sacks in the league in 2014 (52). It appears the Bucs are going young at QB with Mike Glennon still on the roster and the number one pick in the draft. That being said McCown is known as a solid locker room guy with former Bears GM even calling him a “glue guy” (helps hold the room together). Here’s more on that. The Bills are in the market for a veteran signal caller and may also draft a quarterback to add competition at the position to the roster. If the Bills are in fact interested in McCown they’ll certainly be tapping into Kromer’s intimate knowledge of McCown’s game having worked with him closely just two seasons ago.